Like Groupon, LivingSocial isn't afraid to go mass-market with its daily deals. It sold 1.4M $10 for $20 at Amazon deals, selling out in 29 hours in January. The Washington, DC-based company topped that performance by selling out its 1M $10-for-$20 Whole Foods deals in September in 14 hours (about 70K deals per hour). 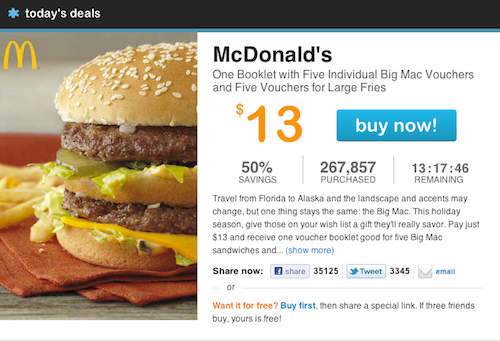 You'd think $13 for $26 worth of McDonald's Big Macs and large fries that never expires might be similarly popular (LivingSocial is promoting the deal as a holiday gift), but its customers are lukewarm at best, buying just 268K out of 1M available deals as of 1pm PT today with 13 hours still remaining. We're not surprised that LivingSocial extended the deal, which started yesterday, to today. LivingSocial customer and serial entrepreneur Kevin Rose tweeted yesterday that LivingSocial -- a company he "enjoyed" -- sold out with the McDonald's deal, later adding, "Last @LivingSocial tweet: we all make our own decisions, I get it.. I just expected more from them, it doesn't always have to be about the $."